Russia is ready to test a new nuclear-capable intercontinental ballistic missile which Russia claims can penetrate U.S. missile defenses and destroy an area the size of the state of Texas. Initial tests will be conducted at the Plesetsk Cosmodrome, about 500 miles north of Moscow. 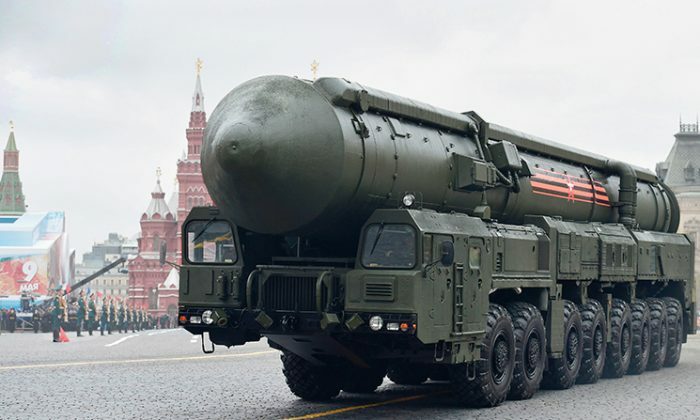 The new missile, dubbed the RS-28 Sarmat, was announced last December by Col. Gen. Sergey Karakayev, commander of the Russian Strategic Missile Forces, as being ready for mass production at the Krasnoyarsk Machine-Building Plant. Design and construction started in 2009. The first-stage engine was tested successfully on Aug 10, 2016. The new missile is supposed to be ready for deployment by 2019 or 2020. The Sarmat was supposed to be ready for testing in earlier this year, but neither the missile, nor its launch silos, were finished on schedule. The silos are supposed to be sturdy enough to withstand seven consecutive nuclear strikes. The missile is reported to weigh more than 100 tons, with a payload of 10 to 15 MIRV (multiple independent reentry vehicles)—that is, 15 smaller self-guiding warheads, each of which can attack a different target. Russia’s state-controlled RIA Novosti news agency reported that each individual warhead could be up to 750 kilotons. In alternate configurations, the missile could carry ten heavier warheads or 24 lighter glider warheads. The missile can also carry anti-missile countermeasures designed to defeat air-defense systems. The Sarmat should have a range of about 7000 miles, and will reputedly be too fast for air defense systems to stop. RIA has reported that the Sarmat has a “throw weight”—the weight of the payload—of about five tons. Michael Kofman, a research scientist from the non-profit Center for Naval Analyses in Washington D.C. doesn’t think the reporting is right. The RS-28 Sarmat will replace the R-36M missile. Apparently, it will receive the NATO designation “SS-30 Satan 2” when operational. NATO called the R-36M “SS-18 Satan.” The R-36 has been Russia’s main missile since 1974. The new Sarmat RS-28 is about half the weight of the R-36M and has about half the throw weight. The RS-28 Sarmat will replace the R-36M at Dombarovsky Air Base in southeastern Russia, and Uzhur in central Russia.